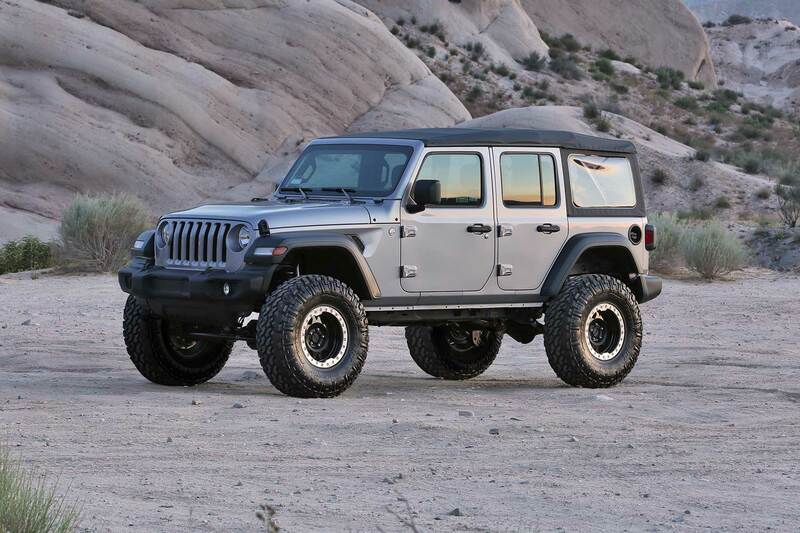 This 5″ Trail system for the Jeep JL provides enhanced suspension performance to address all variants of off highway travel use including rock crawling, aggressive trail use and overland expeditions. On road, the JL suspension has been tuned with proper dual rate coil springs and shock valving to provide a very compliant ride that you will appreciate. The system is a complete short arm suspension that utilizes the factory control arm mounts for an easy installation. The Fabtech heavy duty link arms are constructed of 1.75" OD. .250" thick wall steel tubing that are guaranteed never to bend. They come with large poly urethane bushings on one end with internal threads on the other to accept the ground breaking Fabtech 5 Ton Joint® for longevity and a quiet ride. 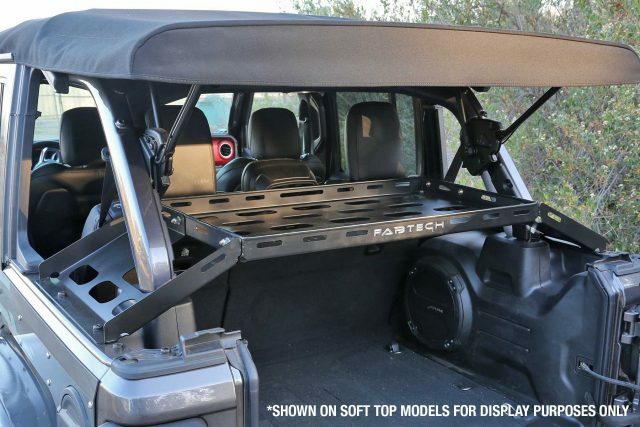 Fabtech’s long travel Dual Rate coil Springs are corner specific to the Jeep JL. 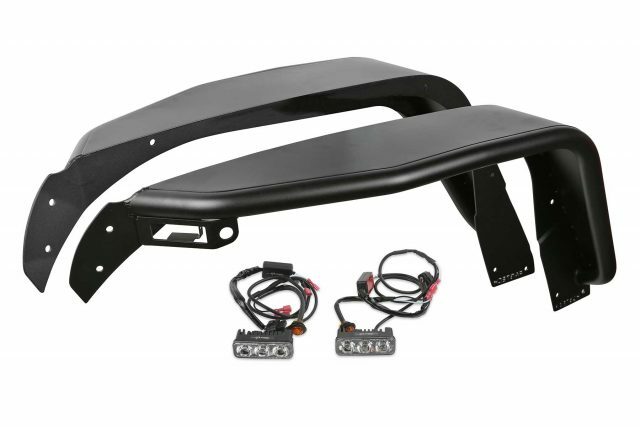 This keeps the vehicle level side to side and allows for increased suspension travel. The first stage of the spring provides a soft ride with the ability to extend for additional travel. The second stage is designed to handle the payload of the vehicle and address large impact absorption at higher speeds. To address the steering geometry with the increased ride height, a Draglink Flip System along with a heavy duty Track Bar bracket is included. This relocates the steering geometry to the factory plane allowing for full articulation without binding the draglink ends in extreme conditions. The factory angle of the draglink to the pitman arm does not change and there is no increased side load on the steering box sector shaft as compared to using a dropped pitman arm. This helps extends the life of the steering box with the increased ride height. 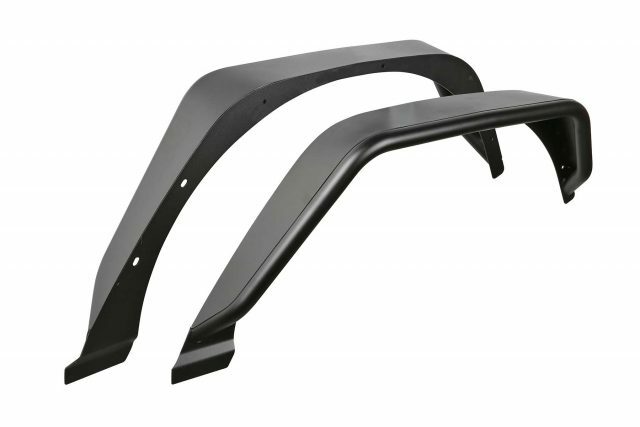 The heavy duty rear Track Bar bracket with side support maintains the factory roll center of the vehicle while centering the axle. Front and rear bumps stop extensions protect the suspension from over cycling. Each Fabtech component has been designed with specific features and benefits that create this quality suspension system. For a greater understanding of each these components please see below. 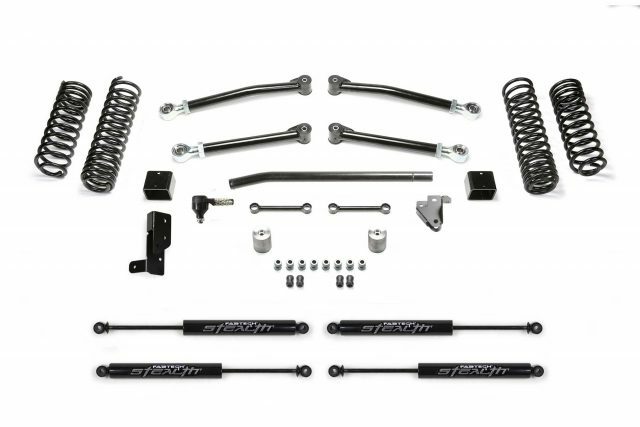 This popular system is a top choice for daily drivers that enjoy tackling tough trails and overlanding with the comfort that they have a high quality complete suspension under their Jeep. Proper factory bushing cross bolt angles are parallel on Fabtech Short Arm link arms eliminating premature bushing wear resulting in poor handling. This system replaces the four lower link arms due to their vulnerability to offroad obstacles and include the massive Fabtech 5 Ton Joints® with a lifetime warranty. 1.75″ OD. .250″ thick wall Link Arms guaranteed not to bend. Corner specific Dual Rate coils springs provide a level stance side to side and offer factory load carrying capacity with a smooth ride. As a true dual rate coil, the first stage of the coil allows the spring to respond to small bumps for a very complaint ride at lower speeds. As the spring travels further, the rate increases to absorb larger impacts and support additional cargo of the vehicle. These American made springs are the best on the market for all around driving while providing increased suspension travel for offroad use. A heavy duty draglink is relocated on the steering knuckle to retain the factory steering geometry with the stock pitman arm. It provides bind free operation at full articulation and eliminates bump steer throughout the travel. It does not increase load on the steering box like a dropped pitman arm can. To work in conjunction with the Draglink Flip System, the front Track Bar is relocated to the proper operating plane with a 1/4” thick steel bracket that bolts to the axle housing for a lifetime of trouble free use. A bolt on 1/4" thick steel bracket is built to eliminate mount deflection when the track bar moves through its full cycle. It relocates the factory track bar to retain the important factory roll center. 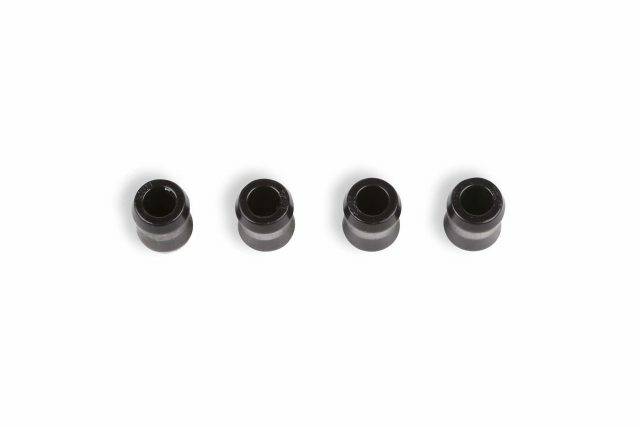 Front and rear bump stop extensions keep the suspension from over cycling with the increased ride height preventing damage to steering and suspension parts. The extensions utilize the factory closed cell cushions for a progressive stop at the end of the suspension travel. The extended length front and rear sway bar links with urethane bushings reposition the bars to work within the factory operating planes. These links are provided to eliminate the sway bar from going over center and creating link bind at full extension travel. Even small details like relocating the parking brake cable with an extension bracket is included to prevent premature engagement due to increased ride height and wheel travel. 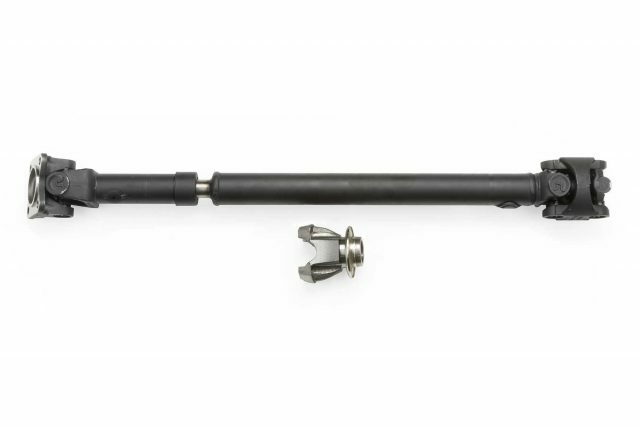 These extended length monotube shocks have a nitro carborized piston rod for corrosion resistance and resist rock chipping. Stealth shocks have a great highway ride with good offroad damping capacity. 121. Fits 6 CYL. models only. 185. Fits 4-door models only. 189. 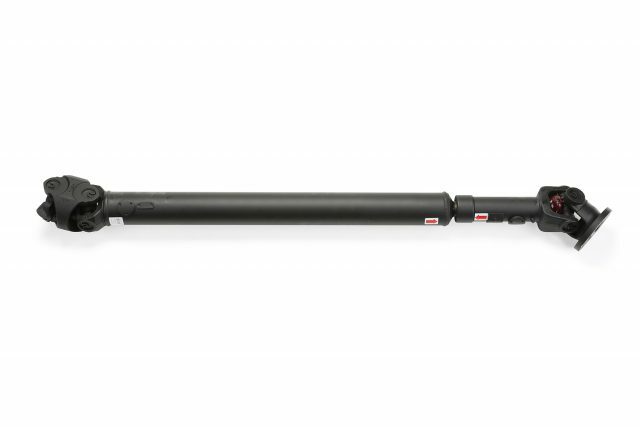 Heavy offroad use requires driveshafts 4 door model Front (FTS94057) Rear (FTS94065).